When you give out presents or swag, it should be handy as well as promotional. No one holds on to foam hands, plastic bats or printed pamphlets for long, but if you give out something useful, your clients, partners and friends will keep it much longer. Consider, for instance, our classic embroidered visors, perfect for vacation, outdoor corporate events or simply a relaxing day in the sun. 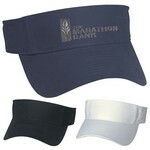 This Custom Embroidered Logo Color Trim Visor Cap features your custom logo embroidered in up to one color. The Econo Visor Cap is a 100% non-woven polypropylene visor that is lightweight and comfortable to wear. It is available with 4-color process to promote your company. Stay cool, dry, and comfortable under adverse weather conditions with the Hit-Dry Cap. It is made from a combination of 60% cotton and 40% polyester material. 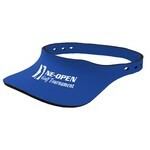 This Neoprene Visor Perfect for team sports like golf and tennis. Add your company name and logo to create a marketing tool that everyone will want to get their hands on. 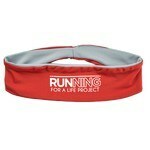 Our Stretch-It Headband is a great Giveaway for Sports Teams, Gyms, Charity Walks, Marathons, Athletic Events and much more. Promote your Company on the Street, Reaching anyone who sees it. Choose a Color Combination that best Compliments your Logo or Event. 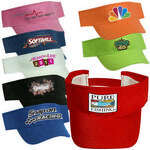 This Customizable Embroidered Logo Breeze Visor features your custom logo embroidered in up to one color.